$500 Instant Savings. Expires Jun 6, 2019. * All prices reflect savings. What to Expect This moderately-paced, escorted tour includes a reasonable amount of walking or hiking and requires an average level of physical fitness. Imagine a setting of verdant rice paddies washed in shades of orange and pink as the glowing sun dips below the horizon. Picture the gentle lap of turquoise waters as they serenely surround towering karst islands. Or, think of the quiet moments—spiritual monks walking barefoot through streets, the feeling of looking out from a mountains summit at the landscapes below, or the taste of a new food you’ve never before tried and just fall in love with. A panoply of experiences awaits on our new, fully-guided small group tour that takes you on an epic journey through the jewels of Indochina: Vietnam, Cambodia and Laos. Start in Cambodia where you’ll find yourself exploring the hustle and bustle of Phnom Penh by Cyclo one day and wandering the ancient and expansive ruins of Angkor Wat, a UNESCO World Heritage Site, the next. 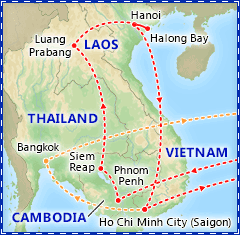 Then travel to Laos—new to the Friendly Planet Travel repertoire this year! Here you’ll ride the mighty Mekong River, witness caves full of gold-lacquered Buddhas and even partake in a spiritual Baci Ceremony (a blessing of goodwill and good luck). Finally, end in Vietnam where you’ll sail the unforgettable Halong Bay, eat your way through a Hanoi foodie tour, and dive deep into the French influence and history of this amazing region as you visit colonial buildings, historical sights, and must-see landmarks. You’ll enjoy all of this amazing touring plus the comforts and inclusions our travelers have come to expect: international roundtrip airfare, high-quality accommodations, bountiful meals, and more. If you’re looking to extend your stay in Southeast Asia, take advantage of your already-included airfare and join our optional Bangkok post-tour extension! Instant Savings: Get $500 off if you book by Jun. 6, 2019! 1. Visa Fee is paid locally. 2. Departure Tax is paid locally. 3. Visa fee is paid locally. Rate subject to change. 4. All visitors to Vietnam must obtain their own visa before departure. Comprehensive visa instructions will be included in your confirmation packet. Note the above fee is an approximate cost, as it varies depending on the type of service you request. The listed amount is based on a single-entry visa obtained from the Visa HQ website. 1. Passengers taking the post tour extension will return to the US 3 days later than the scheduled return date. The Bangkok extension requires that your flights be confirmed separately by the airlines. Please note that it typically takes 3 to 5 business days to confirm your extension flights with the airline, and that we will notify you immediately upon confirmation of the flights. This extension also requires a minimum of 2 passengers to operate. Accommodations: 2 nights Raffles Le Royal, Phnom Penh. Included meals: Dinner. Full Day Itinerary: Arrive today in Phnom Penh, the bustling capital city of Cambodia. The city is located on the banks of three rivers, the Mekong, the Tonle Sap and the Tonle Bassac. Meet your guide who will accompany you to your hotel for check-in. This evening, join fellow travelers for a welcome dinner at your hotel. Full Day Itinerary: After breakfast, take a tour of the most remarkable sights of Phnom Penh by Cyclo, a local means of transportation and an exciting way to explore this lively city. First, stop by Wat Phnom to explore the Khmer-style statues and architecture. Continue on to the National Museum, built in 1917. Housed there are over 5000 statues, lingas and others artifacts arranged according to pre-Angkor and post-Angkor periods of Cambodia's history. This afternoon, pay a respectful visit to Tuol Sleng Museum of Genocidal Crimes, a Khmer Rouge prison and torture chamber from which only seven out of more than 30,000 inmates survived. Afterwards, visit the Champey Academy of Arts (CAA), a non-profit offering the youth of Phnom Penh training in Cambodian traditional arts including music, dance, drawing and painting. Accommodations: 2 nights Lotus Blanc Resort, Siem Reap. Included meals: Breakfast & dinner. Full Day Itinerary: This morning transfer to the airport for your short flight to Siem Reap, gateway to the Angkor Archaeological Park. Upon arrival, meet with your guide and transfer to your hotel for check-in. Later this afternoon, visit Lake Tonle Sap where you will have the opportunity to learn about life on the lake. Tonle Sap is Southeast Asia's largest freshwater lake with its size varying greatly depending on the season. Embark on a boat ride to visit the village of Kampong Kleang where local families live in stilted houses. Enjoy dinner at the hotel this evening. Full Day Itinerary: Set off for the Angkor Archaeological Park, a UNESCO World Heritage Site, that contains the ruins of more than a thousand stone temples. The temples are the surviving remnants of a grand religious, social and administrative metropolis whose other buildings were built of wood and are long since decayed and gone. Built by the Khmer civilization between 802 and 1220 AD, the temples and the great city that surrounded them are one of mankind's most astonishing architectural achievements. Satellite photographs reveal Angkor to have been the largest preindustrial city in the world, with an urban sprawl of 3000 square kilometers and supporting a population of up to one million people. Mysteriously abandoned in the 15th century, the site remained largely cloaked by the forest until the late 19th century, when archaeologists began to clear away the forest and embark on a long restoration process that continues today. Visit the intricately carved ruins at Angkor Wat, built by Suryavarman II during the early 12th century to honor the Hindu god Vishnu. Consisting of an enormous temple symbolizing the mythic Mt. Meru, its rectangular walls and moats represent chains of mountains and the cosmic ocean. Hundreds of fine carvings and scenes from Hindu mythology can still be viewed here. Explore the temples of the Small Circuit. The most famous is Ta Prohm temple, shrouded in jungle and left untouched among twisted banyan trees and stone pillars, it has the most mysterious atmosphere of the temples in the Angkor area. Continue to the mysterious royal walled city of Angkor Thom, the last capital of the Great Khmer Empire under the reign of Jayavarman VII. Its temple is an awesome and surreal sight that most visitors never forget. Be enraptured by the enigmatic gaze of four giant and barely-smiling faces of Khmer royal rulers as Buddhist deities. See the Bayon Temple, located in the exact center of the city of Angkor Thom. This monument includes dozens of towers featuring faces that some believe depict King Jayavarman VII represented as a Buddhist deity. This evening, join fellow travelers for dinner in a local restaurant and watch a classical Apsara dance performance. Accommodations: 3 nights Avani Luang Prabang. Included meals: Breakfast & dinner. Full Day Itinerary: After breakfast at the hotel this morning, transfer to the pier for a boat ride on the Mekong River. En route to the pier, stop for a brief visit to Wat Xieng Thong, one of the most famous temples in the city. Cruise up the Mekong River to visit the famous Pak Ou Caves. Locally called Tam Ting, these caves are filled with thousands of gold-lacquered Buddha statues of all different sizes. As you depart from the caves, notice the local villages along the Mekong, which plays a crucial role in daily life as one of the only means of transport and commerce. Time permitting, stop at Ban Xang Hay, a village that specializes in making rice wine. Once back in Luang Prabang, enjoy a selection of favorites at a local restaurant, followed by a guided city tour. Begin your tour at the former Royal Palace, now the National Museum. Continue to Wat Mai, a temple renowned for its golden bas-relief. This evening, take part in a Laos special Baci Ceremony. This ceremony is a means of expressing goodwill and good luck to others, and is performed in celebration of an important event, such as a wedding, birth or for welcoming guests. The Lao believe that each person has 32 spirits which constitute their spiritual essence and the Baci is the ritual used to call back any escaped spirits into the body. Full Day Itinerary: If interested, rise early this morning at dawn to enjoy a special visit to watch a procession of monks, garbed in orange, walk barefoot down the streets collecting offerings from Luang Prabang residents. Through this serene ceremony, viewers can see the spiritualism of the Laos people. Return to your hotel for breakfast. Drive through the Luang Prabang countryside to the beautiful Kuang Si Waterfalls, seeing picturesque images of the rice fields, hills and small villages along the way. Enjoy the natural surroundings, where visitors can walk to the top of the falls for stunning views, or swim in the pools at the base of the falls. After returning to Luang Prabang, climb the 328 stairs to the summit of Mt. Phousi for a lovely panoramic sunset. Continue to the nearby evening hill tribe market before returning to the hotel. If swimming at the Kuang Si Waterfalls, it is suggested to wear a modest bathing suit and/or covering. Accommodations: 2 nights Pan Pacific Hotel, Hanoi. Included meals: Breakfast. Full Day Itinerary: After breakfast, begin your city tour with a drive past the historical Ba Dinh Square where Ho Chi Minh proclaimed the independence of Vietnam in 1945. Next, visit the Thang Long Imperial Citadel, a UNESCO World Heritage site built in the 11th century. Venture inside and explore the underground war bunker. Continue through the streets past sewing shops that have been in family hands for generations. Visit the Temple of Literature, Vietnam's first university constructed in 1070 by King Ly Thanh Tong to pay tribute to education and to those of high academic achievement. Today, art students sit on the grass and try to reproduce the traditional Vietnamese architecture on paper while enjoying the beautiful and well-preserved gardens of this quiet retreat into Vietnamese educational history. Afterwards, have lunch at KOTO (Know One Teach One) restaurant, a non-profit restaurant and vocational training program for young people in Vietnam. This afternoon visit the highly-acclaimed Vietnam Women’s Museum, offering insight into the lives of Vietnamese women throughout history. Learn about historic and modern-day traditions around spirituality, motherhood, weddings and more. Afterwards, embark on a walk through Hanoi’s Old Quarter, also known as the “36 streets.” This bustling area of narrow streets and alleys is home to thousands of small businesses and shopkeepers. Take your taste buds on a foodie tour to sample the best food Hanoi has to offer. Begin at a “wet market” to peruse through aisles of fresh produce. Outside of the market, wander the narrow streets for some local snacks, such as a fresh spring roll or crispy pancake. Savor fresh rice noodles in grilled pork, called bun cha. Continue on your foodie tour to try traditional sweet cakes or fresh fruit in coconut milk. Walk through the bustling Old Quarter and sip a cup of traditional Vietnamese coffee at a side street café. Accommodations: 1 night Azalea Cruise or similar, Halong Bay. Included meals: Breakfast, lunch & dinner. Full Day Itinerary: After breakfast, drive from Hanoi to Halong Bay. This amazing bay, a UNESCO World Heritage site, is dotted with thousands of limestone karsts and isles. Local legend has it that long ago, when the Vietnamese were fighting Chinese invaders, the gods sent dragons to help defend the land. The dragons spit out jewels and jade, which turned into the islands and islets of Halong, forming a great wall against the invaders. Board your cruise ship and enjoy a welcome drink while receiving a comprehensive safety and boat orientation. 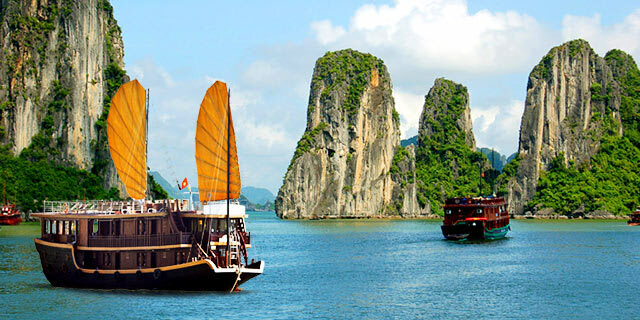 Cruise through the most beautiful and quiet areas around Halong Bay. Proceed to see amazing limestone karst formations that rise up out of the sea. Continue to Ba Trai Dao beach, known for its pristine beaches. Here, try kayaking or enjoy a swim in the clear water. Return to the ship and enjoy a cooking class held by the ship’s chef, who will show you how to prepare traditional Vietnamese cuisine. Later, join your fellow shipmates for happy hour before your sumptuous Vietnamese dinner. After dinner, relax on the top deck viewing the evening landscape. Guests can even try their luck at squid fishing from the boat! Accommodations: 3 nights Pullman Saigon Centre, Ho Chi Minh City. Included meals: Breakfast & lunch. Full Day Itinerary: Rise early for a Thai Chi lesson on the sundeck, followed by breakfast. Afterwards, head out on canoes to explore the bay near the Sang Toi cave. Return to the ship and enjoy an early buffet lunch. Disembark and transfer back to Hanoi in order to take your evening flight to Ho Chi Minh City, Vietnam. Once in Ho Chi Minh City, meet your guide and transfer to the hotel for check-in. Full Day Itinerary: This morning take a city tour of Ho Chi Minh City, still called Saigon by many locals. Start with a visit to the iconic Saigon Central Post Office, considered a symbol of the city and one of its most famous landmarks. Stroll along Dong Khoi street, formerly Rue Catinat and visit the Gia Long Palace (Ho Chi Minh City Museum). Continue to “Le Loi Street” and visit a local artisan specializing in traditional engravings. Stroll through the old central market and get a chance to interact with a local resident. Following this meeting, enjoy lunch at a local restaurant. Later this afternoon embark on a sunset cruise along the Saigon River. View the modern skyline behind you while traveling through quiet canals dispersed with traditional wooden houses perched on the waters’ edge. Full Day Itinerary: Depart this morning for Cai Be, deep in the heart of the Mekong Delta. 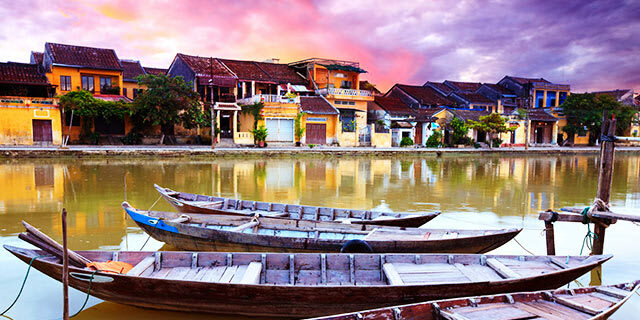 Embark on a private cruise to the colorful Cai Be floating market. Your tour continues with a visit to a local home factory which produces rice paste, rice popcorn and coconut candies, followed by a walk to a roof leaf-sewing workshop. Then, enjoy lunch at Ut Kiet Mandarin Home before boarding the junk again and slowly cruise back from Cai Be as you take in the beautiful landscapes and observe typical rural life on the Mekong Delta. On your return, stop at Cao Dai Temple to witness firsthand a fascinating fusion of Buddhism, Confucianism, Taoism, native Vietnamese spiritualism, Christianity & Islam. This evening after returning to Ho Chi Minh City, join your group for a farewell dinner at a local restaurant. Why not take advantage of your already included international airfare and add three days in exotic Bangkok, bustling capital of Thailand? Your extension includes airfare from Ho Chi Minh City to Bangkok, three nights at a deluxe hotel, half day city tour, full buffet breakfast daily, and all group transfers. Accommodations: 3 nights COMO Metropolitan, or similar, Bangkok. Included meals: Breakfast. Full Day Itinerary: Transfer to the airport to board your short flight to Bangkok, the bustling capital of Thailand, situated on the banks of the Chao Phraya River. Upon arrival, you'll be escorted to your deluxe, centrally located hotel. Your hotel boasts a prime location within walking distance to many attractions. Optional Excursion: Ancient City of Ayutthaya, $110 (purchased locally). This morning drive to the ancient city of Ayutthaya, a UNESCO World Heritage Site. King U-Thong founded the city of Ayutthaya in 1350 as the capital of his kingdom of Siam. By 1700, Ayutthaya had as many as a million inhabitants, making it one of the largest cities in the world at the time. But in 1767, the city was invaded and destroyed by the Burmese army. Magnificent ruins of the old city still remain, some having been restored. Exciting archaeological excavations are still proceeding at many sites in the area. 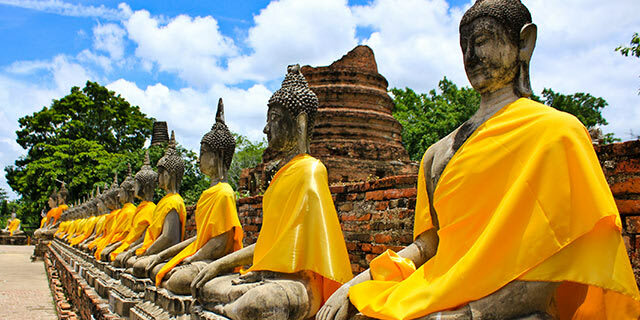 Upon arrival, you’ll visit some of Ayutthaya's historical sites. Among the ruins, you will see the largest monument, Wat Phra Sri Sanphet, Wat Mahathat to discover a Buddha head entwined in tree roots, and Wat Yai Chaimongkhol to view the reclining Buddha statue. Continue to a vibrant market to sample Roti Sai Mai, a Thai dessert similar to cotton candy and sometimes served in a sweet, colorful crepe. After a lunch of local Thai dishes, continue exploring with a leisurely one-hour long-tail boat ride down the Chao Phraya River. See riverside villages and Wat Niwet Thammaprawat, a Gothic-style Buddhist temple located on a small river island. Continue to Bang Pa to view King Rama IV's summer palace, used occasionally by the king and queen to host receptions and banquets. The palace and its surrounding temples represent an appealing fusion of Thai, Chinese, and European architectural styles. Return to Thailand this evening. AVANI+ Luang Prabang is a modern boutique hotel, surrounded by dozens of temples and located between the Mekong and Nam Khan rivers. Situated within a UNESCO World Heritage Site, it is a short walk to the night market, cafes and restaurants and 15 minutes from the Luang Prabang International Airport. Pan Pacific Hanoi offers breathtaking views of West Lake, Truc Bach Lake and the Red River and a refreshing new experience in the capital of Vietnam. Azalea Cruises are the leading line in 5-star cruises on Halong Bay, with a high level of customer service and an unbeatable relaxing environment. The ship houses 20 luxury cabins with an elite, professional crew that will provide the best services throughout your travels. 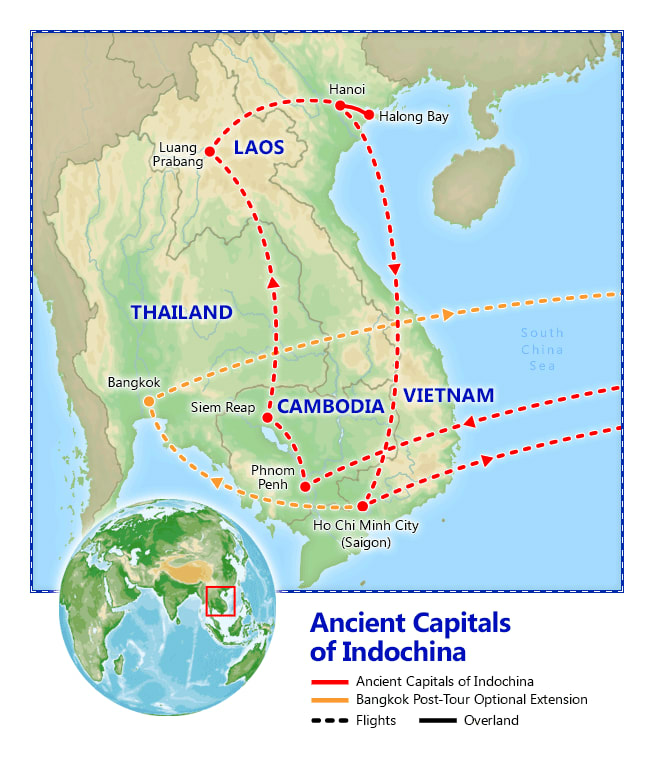 What should I know about Laos? Check out our guide for travel tips, the best time to go, blog posts, videos, and more.